Will Smart TVs revolutionise our viewing experience? Although mobile and on-demand services are on the increase thanks to a lot of healthy competition, the British public still consider live TV to be a bit of an occasion. Consequently – as the TV Licensing organisation has discovered – just 0.1 per cent of us take full advantage of the breadth of TV available, with the rest preferring to sit on the sofa and watch on increasingly bigger screens. It seems we still like to consume TV when it's broadcast live, instead of watching it on catchup services at a later date. The spectacle – the magic of the here and now – is lost in this new technology. And there is a sense of magic involved in television, as Ian Logie Baird (grandson of John Logie Baird) points out. "TV invites us into other worlds so that we may escape the hectic pace of our own. It expands our understanding of the world stage and the roles we can play in it. There is no question television is playing a more central role in our lives than ever." While the competition behind this new wave of TV is making it easier for us to access what we want when we want it, doing so can actually feel more like hard work than it's meant to be. Internet-enabled smart TVs should have a huge impact on the UK – at least in the short term – because they let people without paid-for TV services access many of them, without having to use a PC. The more apps become available for these TVs, the more we will be able to have our cake and eat it. Another of the difficulties with the current TV model is that content creators are tied tightly to distributors, such as Sky, so when you want to watch something specific, you're forced to sign up for the entire service to get to it. In the future, we might not face such challenges. The internet has brought us an incredible amount of freedom, and it should have the same effect on the TV industry. "Traditional TV won't be replaced – TV didn't replace radio years ago"
In much the same way that magazines are now sold directly to the consumer through the internet, bypassing the newsagent, at some point the same will happen with TV and content creators will be able to sell individual programmes or channels to us. It's no surprise that forward thinking TV services, such as BT Vision and iTunes are doing this already. The living room TV will remain the main viewing tool for many years to come. Rather than being replaced with other devices, widescreen TVs will instead be supplemented by them. "TV didn't replace radio many years ago and the same will probably happen with internet or mobile TV." 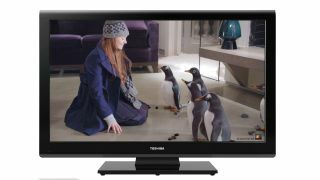 Thomas suggests that TV may instead evolve to suit its habitat, embracing the technology around it. "If you've ever watched Have I Got News For You, you might be aware that as well as watching the show, you can contribute to it over Twitter, meaning that viewers can be directly involved in its outcome." "We will see the rise of the second screen, where viewers will watch TV in the living room while interacting using a second device, like a laptop or mobile to interact with the content on the main TV, allowing viewers to have more choice and more control." Mobile viewing is on the increase, but can it take over? According to a poll of 4,000 people in the UK by Deloitte, more people than ever are browsing the internet while they watch TV – 68 per cent in fact. This time TV interactivity will be a lot more fluid, and viewers will be able to chat with others watching the show. It's no surprise that social networking sites are getting involved in a new and fashionable way. A Miramax movie app for Facebook is on the cards, and the BBC is planning to start selling Top Gear episodes for 93p a shot, allowing users of the site to watch them via an app. Facebook's model is likely to succeed, since pay per view is the most viable means of monetising TV services. Pay as you go will give consumers flexibility and means they can get the best value from the TV they watch. However, there's no romance or sense of occasion attached to on-demand viewing, and with so much content demanding your attention and money, how will you know what's good and therefore what to choose if nobody curates it for you?